Helping your child with a bed wetting issue can be very frustrating, but necessary. 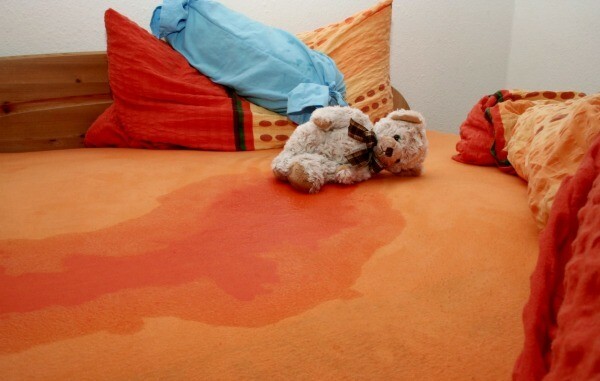 This is a guide about bed wetting tips and advice. If you have a child who soaks the bed in the night, just put a rubber sheet on to protect the mattress. Then add another sheet and then another rubber sheet, and finally another sheet on top of that. That way if the child wets the bed, all you have to do is tear the top sheets off and clean it in the morning. You are not making the bed at 2:00 AM. My 27 month old boy stopped wetting the bed when he turned 24 months, but all of a sudden he started peeing on himself during the day and wetting the bed. What might be the problem? I would switch to pull ups. Do not give up, reward him with a special treat when he uses the potty.Also if he is dry in the morning. Praise him up when he goes in the potty and when he is dry in the morning. Tell him he will get a treat only if he pees in the pot. You have to make him interested in the training process again. I always started at 2 every child is different. My son was 4 before he stopped having accidents. My son is now 7 and we are having a hard time with the bed wetting. I will take his drinks away at 6 PM and wake him up to let him go to the restroom but he still happens wets his bed. He has been prescribed medicine and it isn't working either. I am just tired of doing laundry every morning before I go to work, and it is bothering his mental well being as well. Please help! your son will more than likely grow out of this. for the meantime get him some goodnites. (pullup diapers for big kids). let him take care of using them and throwing them away in the morning himself. do not belittle him he feels bad enough already. Take him to the Dr. They have a pill that will strengthen his bladder. We only needed it for a short time and it was cured. I think you should be sure to have him checked by a doctor. I'm worried that the bedwetting isnt the problem, but rather a symptom of another problem. It might be an emotional problem. Please do not belittle the child for something he cannot help. My son is about to be 7 and has wet the bed on average of about 3 times a week all of his life. We have tried EVERYTHING. The only thing we haven't yet tried is prescription meds. That would be my last resort. I don't know anything about them and was wondering if any parents here have any experience with them? Oh goodness... one of my older sons went thru this til he was around that age. The doctor told me it was worse because he is a boy. For some reason boys are more apt to do this til older. Anyhow, we finally figured out if we stopped all liquids at 6 in the evening, and would make him go to the bathroom several times before bedtime, it would work. Now it took us a couple of months to get it down pat, but it worked. Only every once in a while after that would he wet the bed. But I was finally able to remove the padding... that washing it constantly was so tiring! I was like you and would do anything but medication, especially when the doctors couldnt find nothing medically wrong. My younger brother wet his bed all the way through high school. It affected his self esteem and he never, ever had sleep overs like other kids. His problem was that he was such a sound sleeper he just never woke up. My mom used to get him up every night and had to walk him to the bathroom and tell him to do his business; he never actually was awake for the whole process and one time peed on the wall while my mother stood there yelling at him to stop. Now that he is an adult (he no longer bed-wets) he sleepwalks and has been caught by his wife going to the bathroom off the back porch, and once in their closet! I think doctors tell parents that their children will grow out of it, but a lot of them just do not. I have seen commercials on television for undergarments for children, so you are definately not alone in your problem!! Good luck to you and your son, I hope you find something that works for the both of you. We tried several medications, with no success. We also tried waiting it out, as we'd been told puberty would take care of it. Well, number one hit puberty and still was not dry. What finally worked for us was the kind of alarm that goes inside the underpants (or Good Nights) and the little "box" part pins to the jammies. My younger daughter decided to try it first, and was dry in about a week. The older one took about a month, but her problem was more severe. But it did work and was worth every penny. I did not get up with them with the alarm. Since they had the Good Nights on, I didn't feel the need. It might have taken a bit longer the first few times; but they managed without a problem. My reasoning for not getting up with them was primarily that I wanted them to understand that I knew the problem was "medical" and not behavioral; and that I trusted them to learn this new way to deal with it as I had always trusted them to deal with it. By the way, number 1 had never, ever been dry through the night; but number 2 had been, and then began to wet again--which is not uncommon; nor is it behavioral. They can't help it. My view was that it was like any ongoing medical problem--except that ours would eventually get better! So I saw that part as a true blessing! Hallo. have you had your son checked out by a chiropractor? joints that are not properly aligned can put pressure on the muscles in groin area. I find it hard to explain as I am not a chiropractor, but I seen amazing results with my own kids. We used an alarm on one of our 3 daughters (search thrifty fun under potty training for the full story of that). Anyway, we bought the cheapo alarm on ebay (you'll see them, they sell a ton). It's cheaply made but it worked & was only around $20. The more expensive alarms are around $100. Our daughter will be 8 in May and she sleeps in a pull-up....we do not make an issue of it and she doesn't seem bothered by it. Every now and then the pull up is dry but most mornings it is wet! She does fine in the daytime but was late to train. I haven't mentioned to the Dr yet as I really wasn't interested in medication or surgery. I'm sure she will grow out of it in time. Sure I'd like to quit buying the pull ups but better to spend the money on those than wash sheets and change bed daily! Wow, it really is a problem! I think it is an inherited problem. Four out of my husband's five kids had this problem. The pull ups work well, but you have to make sure they go right out in the trash. We have never found out what the cause of the problem is. It does help to restrict fluid intake after 6pm. But, the medications that are out now work very well, I totally empathize with anyone that has this problem! Please have patience and love! This too shall pass! WE HAD THE SAME PROBLEM WHEN OUR DAUGHTER WAS LITTLE. WE TRIED TO TAKE AWAY DRINKS EARLY IN THE EVENING, WOKE HER UP AT MIDNIGHT,EVERYTHING. SHE STILL WOKE UP SOAKED IN THE MORNING. AT AGE 5 THE DR PUT HER ON MEDICINE AND SHE STOPPED. SEEMS SHE SLEPT SO DEEP AND HER BODY WOULDN'T WAKE UP . I know you won't believe this, but try a chiropractor! My son, now 17, wet the bed 3-5 times per night, every night, for years. His father & I were divorcing, he was 4-5, and I was ready to put him in counselling to help - I did not want him on medications! Our friend, a chiropractor, asked to see him when the topic came up over dinner one night. My son was a forceps delivery - which may have pulled him out of alignment - anyway, I do not understand HOW, but after ONE ADJUSTMENT, my son went from 3-5 times soaking bed at night to 28 days without even one accident. It's definitely worth a try before medicating the little darling! I have a teenage daughter on some heavy medication for other ailments that make her incontinent at night. She takes Desmopressin (which is generic for DDAVP and don't ask me what that stands for!) It is a mild diuretic and works like a charm. However, I would recommend trying a homeopathic doctor for this problem. My daughter has had terrible nausea, and the homeopathic doctor gave her little pellets of hellebore to take and it's completely cured her. I'm going to have him prescribe something for the incontinence, too, and see what he comes up with. You'll find that for almost every single kid who wets the bed it is NOT a medical problem, it is merely a sleep problem. Our son wet the bed for years, and we discovered that when he sleeps he falls into such a deep sleep that he cannot wake up enough to hear his body telling him that is is about to pee. We paid a fortune for a consultant and large pad that would sound when the pad got wet. He had to wake up and change his sheets etc. It was such a waste of money. A friend gave us an alarm that is attached by velcro onto the undies, so that the very first drop sets it off. The other end of the alarm is velcroed to his t-shirt, so it buzzes right into his ear! We were watching a movie the first night it went on, and heard this yelp from his room ... HUH??? It was hilarious. He was in a daze, so I told him he needed to pee. It only went off once more after that, and the alarm taught him to wake up as soon as the pee muscle was about to go into action. Don't bother restricting fluids, don't bother with pills, don't bother with counseling, just get el cheapo alarm and watch the magic happen. Michael Landen used to wet his bed. His mean mother would hang his sheets out the window for all to see thinking that would stop him. He used to run home every day to get them in before the other kids could see. Later he ran in the Olympics! I had two kids who did it every night. Changed their sheets every day for years I thought of him every day. My ex-husband did it until he was 13. I just figured they inherited it from him. Seems like the timer would work I wish I knew about it when my kids were little. I don't think I would take him to the dr. I would call the dr. if they want to see him I would take him. But taking him might upset him. One of my sons had a wetting problem also. We went to a urologist. He asked if my son drank tea. He did. The doctor said he could have all the tea he wanted, before noon. He explained that for ever cup of tea you drank, you pee a cup and a half. it could be possible that your child is a type#1 diabetic! it 's a simple blood test ! please have him tested. i have a friend whose daughter started wetting the bed for no good reason & after testing they found out she had diabetes. i hope not but you need to have him tested! My 10 year old daughter has wet the bed for years. Nothing is medically wrong. I have found this is common, so she wears Goodnights to bed, but in the AM she'll lay in bed, wide awake and wet her pull-up until it runs out onto the bed. I ask her "why", she says she doesn't know why. I have, in the past, been very patient and understanding, but today I lost it. I made her wear the nasty wet pull-up around the house for punishment. What is up with this? Is it a fetish? Is she mentally ill? I have lost my mind. I told her if she does it again she will have to wear it to school and I will tell all her friends. The parent in me knows this is not the right approach, but I am at the end of the road here. What else is there to try? I have a son who just turned 5 year old who still wets the bed almost every night. We currently put him in Pull-ups, but he often makes so much pee that it even leaks out of the diaper onto his clothes, sheets, blanket, etc. You must be going through a lot right now. It's normal to be so frustrated about something like this. I'm sorry to hear that you "lost it" with her today, but I completely understand since I'm a mom too. Please don't give up. There is a solution out there somewhere. Around the age of 8 I started having problems with "leaking" and not being able to control it. My parents took me to doctor after doctor for a couple of years who told them that it was all mental and that there was nothing physically wrong with me. I suffered humiliation at the hands of both my parents who believed the doctors and my siblings, who teased me about it. I believed what they said too and it caused me years of pain and did significant damage to my self-image. As an adult, I finally got the courage to mention this problem to my gynecologist who ran some tests and found that my bladder was severely prolapsed. One quick surgery later and I no longer have the problem. Shaming her is not the answer. If she has been checked out by the doctor, use a behavioral program. Tell her she is responsible for her own situation. She will need to strip the bed, wash everything and re-make the bed if she wets. Set an alarm clock for her wake-up and insist that she go to the bathroom as soon as it rings, no lingering in bed. That is a privilege she will have to earn. Try not to get emotional when she wets, just re-state that she needs to clean up the mess, etc. Unless you have taken her to an urologist for a urethral dilatation exam in a hospital under anesthesia, (if surgery is required, it is done at that time, you cannot be certain that she doesn't have what I had at age 14, causing me to wet without fail. I had a non-malignant urethral tumor that had to be removed surgically.) Until discovered, my mom was as frantic and frustrated as you, but not nearly as terrified as I was of the spankings, false reasoning, yelling, loss of sleep, threats, and thoughts of the loss of my mother's love, blaming me for the whole thing. She took me to many doctors and finally learned about it, but was given the choice of having the surgery in the office or hospital. Knowing it would be most painful, but she was so anxious to get it over with, she chose the office without anesthesia and worse yet, never apologizing for all she had put me through all those years. It took me 49 years to truly forgive her, and it ruined my trust in humans, doctors (he should have insisted on my being admitted into the hospital for pain relief), and later on I still suffered post traumatic syndrome all through my life/marriage, and under certain conditions, to this day, crying at the most inappropriate times. It took counseling to finally help me to discover why/what/when/where/who, etc. I urge you to please reconsider and make certain of the medical implications. Each of the "reasons" and "guesses" given in this blog was made about my situation. Also, if after this exam, you do "not" find a tumor (which held my ureter open abnormally causing the bladder to empty when I tried to sleep), please consider that there may still be a real medical explanation that has not yet been discovered or diagnosed by anyone other than a very good doctor. How would you feel if it were you? No one has the slightest clue of how horrible it is to suffer in this way. Give your daughter more of the benefit of the doubt until you have truly exhausted all the possibilities. Then, if you were wrong, hug her in private and tell her simply how sorry you are for not knowing. God bless you both. and observations and are not intended as criticisms directed at anyone. If I were the young person wetting the bed I know my own personal pain and embarrassment would exceed any embarrassment or frustration or aggravation my mother would be feeling. I might try to hide that fact from her, but inwardly I believe I would be dying a little every day. Can those of you who are dealing with this put it in perspective? You could be dealing with something so much worse. My next door neighbor has a beautiful 18 year old daughter. She was born with cerebral palsy, she functions as an 18 month old and requires constant care, which they lovingly provide. Another acquaintance has a child with cancer and her future looks grim. I truly don't understand the constant fights over wet sheets and bedding. It is a fact, not a surprise, that you have a bedwetter. It is also a fact that dishes get dirty and have to be washed. It's also a fact that everyone needs clean clothes so the laundry must be done. I have a son who just turned 5 year old who still wets the bed almost every night.